Winger Mekhi McLeod has joined National League South side Welling after leaving FC Halifax Town. McLeod only made eight first-team appearances for Halifax after joining the club last summer, and his contract was cancelled earlier this week. 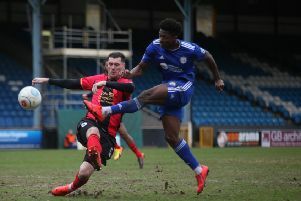 “I signed Mekhi, knowing Mekhi, and not doubting he has attributes and qualities that I felt could add to what we were,” said Town boss Jamie Fullarton on the player’s departure. “But as things transpire in the environment, some people can respond to the demands of attitude and application, and some people don’t. “And then you have to make decisions, when you have a squad that is becoming close to full fitness. “It was right for the group, for the club and for Mekhi that we parted company. “It’s always a difficult decision as a manager. But how people respond and react to our environment, some people do well, some people don’t. “And when they don’t, then something has to change, and Mekhi’s moved on to pastures new, and I wish him good luck on that. When asked whether McLeod’s departure would free up space in the squad for any new additions, Fullarton said: “I’m constantly looking to add to the squad, constantly. “For someone that struggled to break into the squad due to various reasons, then you look to bring someone (else) in if possible. “I’m constantly doing that, it’s a daily routine of looking to recruit and improve.